With its 2008 Panasonic Viera Plasmas, Panasonic brings anastonishing 1,000,000:1 contrast ration to the table. advanced pixel resolution and image-processing technology with the plasma TV's natural ability to beautifully reproduce fast moving images, so every detail is rendered with amazing clarity, and all the action is delivered with a high degree of fluidity. Super Contrast--native contrast ratios on the PZ85, PZ800 and PX 850 series are 30,000:1, double last year's 15,000:1. Dynamic contrast ratios are up to 1,000,000:1. Which Viera is Right For You? Click here to see a comparison of step up features on each Viera series. The incredible black reproduction of a Panasonic High-Definition Plasma TV results in impressive contrast and beautiful, natural colors. So you'll get warm, accurate skin tones, gorgeous greens, breathtaking blues and vivid reds. For color that's as rich and bold as life itself, look to a Panasonic Plasma TV. A Panasonic Plasma combines anti-glare and anti-reflection technology with the natural light-emitting properties of plasma, to give you a super-wide viewing range with a crisp, beautiful image from almost any angle. When you're watching sports or movies with fast-motion graphics, you want a TV that can keep up with the action. With over 900 lines of moving picture, self-illuminating plasma displays eliminate afterimages in fast-action scenes. So whether you're watching a sporting event or an action-packed movie, you'll always get the most impressive viewing experience possible. 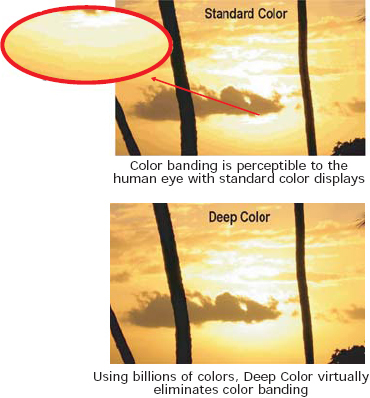 Viera HDTVs support the xvYCC color profile (Extended YCC Colorimetry for Video Applications), or "x.v. color" for short. 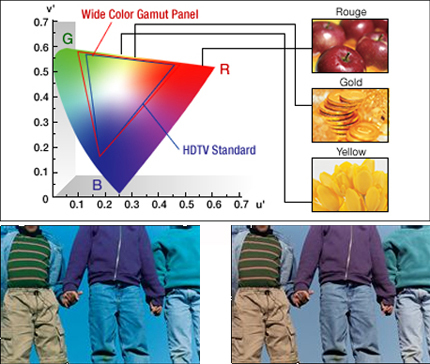 Standard RGB color space allows the display of a portion of the colors that are viewable to the human eye. The next generation "xvYCC" color space actually offers? an available range of colors that exceeds what human eyes can recognize. Where x.v. color expands the available range of colors your HDTV can display, Deep Color increases the number of colors your HDTV can display within that range, for smoother transitions from color to color. Can represent many times more shades of gray between black and white. Viera flat panel HDTVs interact with an array of high-definition devices and services, making it easy for consumers to access and enjoy content as never before. 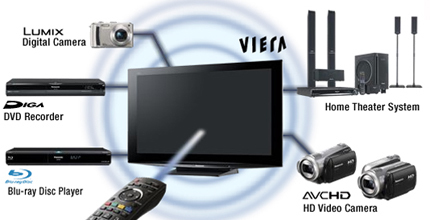 As of 2008, Viera Link is compatible with Onkyo and Yamaha home theater systems. Videos and stills recorded on SD cards can easily be viewed via the SD slots on Panasonic Blu-Ray Disc players and Viera HDTVs. Viera Link means easy connectivity via HDMI cables. Finally, consumers can easily operate their Blu-Ray Disc players, DVD recorders and home theater systems with a single remote control device. 4 HDMI inputs to connect all of your devices directly to your television. Equipped with an RGB input terminal, VIERA can connect with your PC and serve as a large-screen monitor. 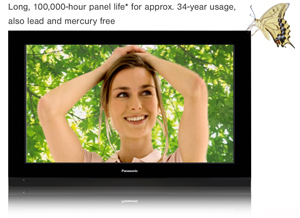 Panasonic plasma panels are rated to last 100,000 hours, which is about 30 years of regular or 11 years of non-stop usage before the brightness of the display is halved. 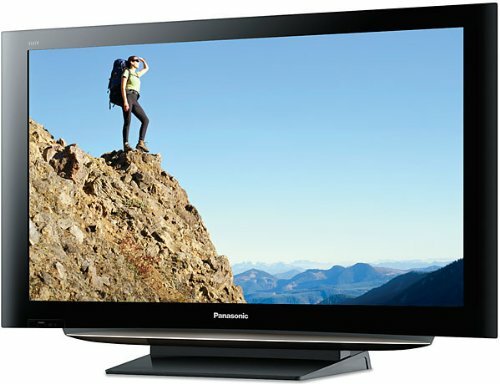 A Panasonic 1080p plasma television is able to render 1920x1080 pixels, but standard DVDs have a resolution of just 720x480. 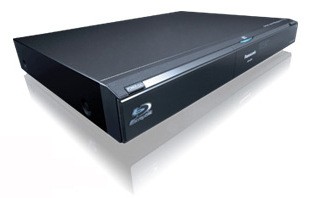 Blu-ray discs output true 1080p High-Definition resolution and have a storage capacity ten times greater than standard DVDs, so no pixel gos to waste. Which is the Right Viera for You? In October, I purchased a Panasonic Viera TH-42PZ85U Plasma Television from Amazon. One of the caveats about owning an HDTV is that it requires quite a bit of time to tweak picture settings in order to ensure that your TV is giving you the best possible picture. In the proceeding months, I've fiddled with the various settings, like color, contrast, brightness, and even used a THX calibration disc and blue filter glasses in order to calibrate my set for optimal viewing from all of my sources (FiOS, DVD, PS3/Blu-Ray, DVR, Xbox). Overall, I've been quite happy with my Panny. However, in recent months, I've noticed a very disturbing and annoying trend occuring in my TV: phosphor trails. These are green or blue trails that are left behind a moving object in a high contrast scenario. It occurs, as I understand it, because plasma pixels cannot shift directly from black to white, or vice versa. They have a brief green or blue phase in between. An example of this might be a hockey game that has players with dark jerseys on a white ice background. This scenario is plagued by phosphor trails on my TV. The players leave streaks as they move across the rink. I love hockey, and this is a major issue for me. Another example might be a movie or TV show where a person with light skin is moving through a dark room. This scenario is even worse for me. Light objects on dark background leave horrible green trails and are physically taxing on my eyes. Video games often have high contrast scenarios like this, and this effect is present in many that I own. Very happy about this purchase. This is a fantastic hi def plasma tv. After a ton of research, reading reviews, in store comparisons, and the clincher, seeing one in the home of a friend, I ordered it through Amazon. I could not be happier with my choice. It looked amazing right out of the box, and with just a little change or two, its simply mind blowing in detail. I plugged in my son's PS3 to play a blue ray movie just to see how at looked, and wow! Now thats home entertainment! This is a nice plasma TV for the price. I bought it to replace a 3-year-old Sharp LCD TV. The new plasma shows much better low-definition images and a lot less motion blur in sporting events. High-definition looks good, too, even though I've only watched 720p feed. I read some reviews that said this TV shows too much red in images. This is perhaps occasionally noticable but is just a minor issue as far as I'm concerned. Overall color representation is good, though I'm not sure I would label it as great. The TV was hundreds of dollars less than some higher-rated models, so you have to expect some trade-offs. Pros: Good image, good sound. Cons: Controls on the TV are on the side and difficult to use if the TV is mounted since the labels are difficult to read. If you see a movie in 4:3 format, the sides are bright grey in color and distracting (it is black in Sony TV. I have not figured out a way to change this! Buy it! No disapointments found. Great Picture, Great Remote, Good Sound. Picture is stunning in 1080i and likely will be mind boggling in 1080p Blu-Ray. For the price, hands down a BEST BUY. The 42PZ85U lives up to its reviews. As others have done, I spent time to research both plasma and LCD units in the 40" to 42" range. The reviews on this site were very helpful toward my choosing the Panasonic Plasma. Once ordered though Amazon, delivery was prompt, actually arriving two days earlier than initially promised. The delivery was smooth - "white glove" delivery was accomplished as promised, with two deliverymen who set-up the unit, assembling the base, inspecting the unit, and turning it on, testing for a picture. We decided, in my situation wherein I have storage, to leave the carton, in the event that a need to return the unit might occur. Both men removed their shoes, and during set-up told me they were happy to have their jobs, as both had been laid off from a factory where they were previously employed. They were sub-contractors of Pilot. I started researching TV's about 6 months ago. I was originally in the market for an LCD, and was completely sold on them. This was mainly because of all the negative (and mostly outdated) hype that I heard about plasma's. After doing more and more research, reading as many message boards and articles as I could, I actually decided to go with Plasma. I later decided on this one, thanks to the positive feedback I read about Panasonic. I also chose this model thanks to the great deal I received on Amazon. I got this model for the same price that the 80-Series was going for in the stores, and with the free "White Glove" shipping at the time, I couldn't pass it up. The features on the TV are all excellent. Picture quality is great. Sound could use some work, but if you play with the settings enough (Bass, Treble, Audio Leveler, Surround Sound, etc...) I can produce a good sound. It can be a pain sometimes, but I can live with it. The White Glove service was fine. Only one guy came to my house...not two. He had the thing set up and on my stand in 15 minutes. This seems to be an area of varying reviews. For me, the service was fine. He unpacked the TV, put it on the stand, put the whole thing on my TV stand, plugged it in and tested it. The only thing he didn't do was hook up the external devices, which I thought he'd do, but I'm fine with it. I don't mind hooking all that up myself. I REALLY have to go out of my way to see the "burn." It's actually more of a moderate-severe case of Image Retention...yes, there's a difference. I have to have ONLY the TV on, in a VERY dark room to see it, and only when I'm close to the screen. It is NOT visible when watching TV or movies. A WORD OF CAUTION...if you're going to play games, do not be pulled into a false sense of security with the "Game Mode" like I was. You'll see by default, the Brightness setting is at 100. BIG NO-NO. PLEASE turn it down to 50 or so...I currently have mine at 40 I think. I attached a coax cable to the antenna port on the back of the TV, without anything else on the other end of the cable...kind of a make-shift analog TV antenna if you will. I then switched the TV selection to "TV" and programmed analog and digital channels...it found about 9 of them. After that, I pulled out the coax cable on "Channel 4." This produced a blank channel, filled with "snow." This is what you want!!! It's this "snow" or "white noise" that cleans up your screen. Turn your picture settings up to 100, and let this run for a while...when I say "a while," I mean a few hours...you don't have to do it all at once, just here and there. What I do, is turn my sleep timer on for 60-90 minutes before I go to bed, and let it run. Do this a few times, and your screen burn will be gone. I read somewhere that this is exactly what TV techs do...and charge hundreds to do it! Please note, that depending on how bad the "burn" is, you may have to let this run for several hours. And honestly, it should probably go away on its own after about a month of normal viewing...this is extreme cases only. All in all, a good TV and I recommend it. You just need to pay attention to what you're doing/watching. I've had mine for 2 months now, and except for the screen burn (which is really a non-issue...I'm just particular about it) I've had no problems. Good choice for HD vieweing! We are very pleased with this new Panasonic HD plasma. After we ordered it at Amazon, it was delivered at our house only five days later! at the hours scheduled!! Bravo, what a service! The TV is simple and clean look and provide beautiful HD image BUT it is not so great with the standard 480 definition. So, only for HD viewing or HD movies. Perfect with DirecTV HD channels! After viewing college bowl games last New Year's Day on my sister's big screen TV, I told my wife that we should get a high definition TV before the 2008 football season started. So, as August approached and preseason predictions proliferated, we began to look for a new high definition large screen TV. To my dismay, I learned that there is not just one type of product that generally fits that description. Different brands and models vary in their degree of resolution (number of pixels, number of lines of resolution, etc.) which affects the quality of the picture and the capability of the TV to utilize high definition "input", whether it be cable or satellite TV channels, electronic input from a "Blu-ray" or "up-converting" DVD player, input from a gaming device, or possibly even other sources. I also learned that there were two basic types of these TV's regarding the basic manner in which the visible image is produced in/on the screen--plasma and LCD. In my case, the biggest issues to be decided were these two--the number of lines of resolution and whether to buy plasma vs. LCD. Once these "technical" options were decided, choosing between the available brands and models that satisfied these options was relatively easy. I found that many of the TV's on display in stores with attractive prices were TV's that had only 720 lines of resolution, though they presented a picture of very good quality from current TV programs via cable or satellite. It seems that the "geeks", and perhaps the industry, do not consider anything less than 1080 lines of resolution to be "high definition. Presumably, 1080 lines of resolution is the minimum number needed to take full advantage of a true "high definition" TV signal or other high definition input. Thus, I decided that I wanted a TV with at least 1080 lines of resolution. With regard to the plasma vs. LCD issue, it appeared that in the past, plasma has been considered necessary for the TV's with larger screens (50" in. or larger), while LCD was generally associated with smaller screens. Plasma was generally considered to give a "brighter" picture, but LCD did not have the risk of certain technical problems associated with plasma (i.e. "screen burn-in" from the same static image displayed too long on the screen and eventual failure of the bulb or light source for the TV requiring a presumably expensive replacement). However, continuing technical development has decidedly narrowed the differences between the two with regard to performance. LCD TV's with 50" or larger screens are now common on display floors and the projected "half-life" of replaceable plasma "bulbs" is well in excess of any resonably expected useful life of the TV. The risk of screen "burn-in" seems to be almost nil under ordinary usage and conditions. I visited several "Best Buys" and other stores with TV displays and concluded that the plasma TV's did appear to more consistently present a brighter and sharper image--though some of the LCD's were very close. After much deliberation, including reading reviews on line as well as watching in-store displays, I chose plasma. Response time (sort of the equivalent of the number of frames per second in movies on film) was never really an issue for me. Most of the sets that I viewed seemed to fall into a range of about 2 to 6 milliseconds response time. I am not a "gamer", and virtually all TV's I viewed were capable of showing the programs that I watch without a noticeable problem of "blurring" in action scenes. If you are a really serious gamer, or really concerned about quality of high-speed action scenes, then response time might be a factor for you to consider. After deciding upon a plasma TV with 1080 lines of resolution, it was relatively easy to settle upon Panasonic Viera. The 42" size was virtually dictated by the space which we had available. Cost and physical appearance were virtually the final deciding factors. Once we got the TV hooked up and in operation, we have been very pleased with it. As far as I know, the quality of the picture, especially with regard to brightness and sharpness, is unsurpassed. I really do not know how it could be better. We only have it hooked up and in use for satellite TV signal from Direct TV, and not all channels are in HD. The image is very good even on non-HD channels and the HD channels are terrific. I assume the picture quality would be comparable from any HD input such as a Blu-ray or up-converting DVD player. Pro's: Great picture, very bright, very sharp; very competitive cost; relatively easy to hook up; occupies less space than older TV's with comparable screen sizes. Fast and careful delivery by Amazon and its delivery system. After reading the reviews on this set, and looking at it at Costco. I took the plunge and bought it here at Amazon. The free shipping and no sales tax made it an even better deal. I have had it set up for a day so far, but I am really happy with it. Set up was supper easy. I am an IT administrator so I am used setting up tech gadgets. But really anyone would find this easy. There was (3) cables for me to plug in. Sat feed cable, power plug, and the HDMI to the DVD player. Really can't get much simpler. On screen setup was cake. The Viera link worked as advertised with the up converting DVD player(Panasonic model S54). I don't get teh glare issues on the screen some report due to where it is setup in my living room. One point of caution use (2) people to life it into its spot. Its not heavy, but the shape makes it difficult for one person to do. Don't need to go dropping your new $1000 tv. I know some reviewers had "issues" with Ceva logistics on the delivery. The local branch in Reno did a good job by me. I had no issues what so ever. I was unsure about ordering this TV online, well I took the leap and it paid off! Over the years I have ordered a bunch of stuff from Amazon.com without any problems but nothing this large and fragile, the delivery was flawless(make sure Amazon has latest phone # and address info). The package was in excellent condition (no dings or holes, the delivery person (CEVA) bought the TV inside for us. We have been looking at this TV for a week now and "WOW" it is remarkable what a difference in viewing pleasure. setup with HD DVR (Cablevision)was a piece of cake. Would highly recommend this "Fantastic" HDTV to anyone and would recommend they consider buying it from Amazon.com. I did it all. I looked at over 20 different models of HDTVs. LCDs, DLPs, Plasma, projector and CRT. All different sizes, too. I read over 200 reviews, both expert and consumer. What ultimately turned me to Plasma was picture quality. Smoothness of motion, color richness, exactness of details. I chose the 42 inch because it has better definition than the 46 inch. The expert reviews were all about the bigger 46 inch screen but it really didn't fully compare to the 42 inch. The 42 inch is better in color accuracy. And what outstanding high definition! I've been playing both DVDs and Blu Rays and they both look great. There is a difference but if you never experience it you won't miss it. Once you do experience it you'll want more. A good example is a video with snow. All the experts talk about the true black of these great plasmas but what they overlook is in a scene of light and motion like snowmobiles driving or skiers really moving it. You can see definition of the snow as it gets blown around. On everything else the snow is a blur. On this HDTV it's snow fluff moving through the air. I mean you can almost see every snowflake. Also, while it's true at 8 feet away there is very little seeable difference between an LCD or Plasma 1080p vs. 720p if there is a detail you need to see you can get inches away from the plasma to see it and the picture looks great. Believe me there are momments that it's good to be able to pause the video to see an important detail that wouldn't show any other way. One of the sillier points reviewed is sound. This plasma has better sound than any CRT I've ever had and the only panel TV with better sound without using a surround sound system cost $3000 more but it's hard to imagine anyone spending over a thousand dollars on a TV and not hooking it up to a great sound system. I've had the TV for two month and I am still impressed. My only disappointment is the lack of PIP but I can live without it.